*I received a review copy from the publisher with no expectation of anything other than an honest review. Suggest a thriller or mystery (or a horror story!) to me and chances are I'll be interested. I love the kind of reading that keeps me gripped, guessing, turning the pages. 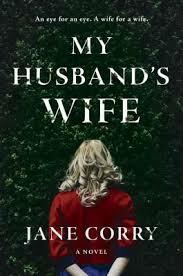 So when a pitch arrived in my inbox for My Husband's Wife by Jane Corry, I was interested. The tagline reads, "an eye for an eye, a wife for a wife." I mean come on. How intriguing? I did enjoy the book. It's the story of Lily a young woman who is recently married. She's also a lawyer who is starting out in the trenches and taking on a case of a man accused of murdering his girlfriend. It's a difficult case, but because he reminds her of her brother she's drawn to him and feels an increased connection and sense of empathy for him. Her own marriage isn't what she wishes it was--she and her husband struggle, but she does try to make it work. And baby-sitting for a little girl next door, Carla, who is from Italy (this book is set in England) helps to bond them in some ways. The girl herself is struggling to come to terms with her own life but enjoys sitting for Lily's husband Ed to draw. There's an event and then a huge time jump and then some more stuff happens! I hate to give away too many plot details. But the premise of the book was interesting and kept me with it which made up for the fact that the writing itself was very serviceable. There were times I felt the tension could have been drawn out and the language is basic and functional but doesn't necessarily draw the reader deep into the characters or action. Even still, I finished the book.